Fabrication and Self-Assembly of Nanobiomaterials presents the most recent findings regarding the fabrication and self-assembly of nanomaterials for different biomedical applications. Respected authors from around the world offer a comprehensive look at how nanobiomaterials are made, enabling knowledge from current research to be used in an applied setting. Recent applications of nanotechnology in the biomedical field have developed in response to an increased demand for innovative approaches to diagnosis, exploratory procedures and therapy. 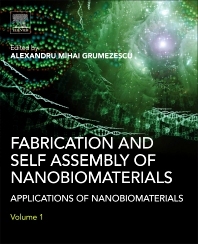 The book provides the reader with a strong grounding in emerging biomedical nanofabrication technologies, covering numerous fabrication routes for specific applications are described in detail and discussing synthesis, characterization and current or potential future use. This book will be of interest to professors, postdoctoral researchers and students engaged in the fields of materials science, biotechnology and applied chemistry. It will also be highly valuable to those working in industry, including pharmaceutics and biotechnology companies, medical researchers, biomedical engineers and advanced clinicians. Alexandru Mihai Grumezescu is a lecturer in the Department of Science and Engineering of Oxide Materials and Nanomaterials, at the Faculty of Applied Chemistry and Materials Science, Politehnica University of Bucharest, Romania. He is an experienced researcher and published editor in the field of nano and biostructures. He is the editor-in-chief of two international open access journals: Biointerface Research in Applied Chemistry, Letters and Applied NanoBioScience. Dr. Grumezescu has published more than 200 peer-reviewed papers, authored nine books, and has served as an editor for more than 50 scholarly books.